Do You Own An Electric Blanket? Here Are Some Essential Dos And Don’ts! Electric blankets of today are much advanced and modern as compared to what they used to be a decade back or even before that. If you have any memories of your parents or grandparents using an electric blanket, they were all bulky and scratchy. Today, we have all sorts of improvements. The blankets are much soft, energy efficient, use low voltage technique, are water resistant, also shockproof and hence prove absolutely safe for you. But, to ensure even more protection, there are a few tips on making the entire experience positive. 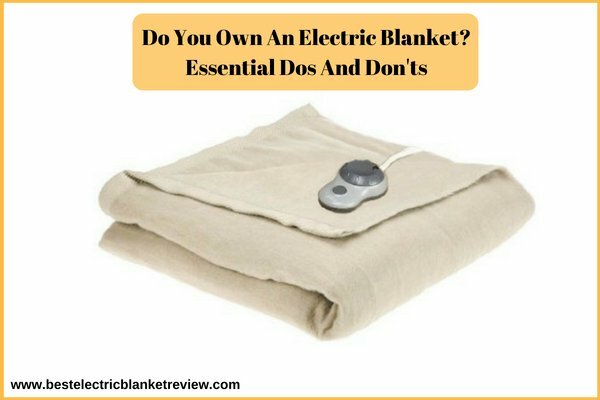 Follow these simple Dos and Don’ts for safely using an electric blanket. These blankets are unlike the traditional ones – both in term of working and handling. Therefore, some maintenance is required. But, that’s nothing as compared to the comfort you get in return. Purchase an electric blanket that’s approved and recognized by an international testing agency. Underwriters Laboratories (UL) standards are a must check safety certification. Make sure to read the instructions specified in the manual by the manufacturer. Before operating the blanket and also otherwise, keep looking out for any wear and tears. Discard using the blanket immediately after you come to know of any damage (tear, break or fluctuating temperature). Keep the cords loosely wrapped and not too tight else it can damage the same. Pets and children must use the blanket only when someone’s around. To avoid intense heating, keep the electric blanket flat and not all balled up! Purchase an electric blanket that comes with the Auto-Shut feature. Exactly follow the washing instructions mentioned for your particular blanket type. Energy efficient blankets save more power. Buy those! Let it cool before you store the blanket away. Unplug the power cord after every use. Do not submerge the power plug or cord in water. Use a mild detergent along with the lowest machine wash settings. Go for only a few spins and hang the blanket long without any unnecessary folds. Use a blanket that has multiple heat settings so you do not feel uncomfortable when under it. Make use of the auto shut feature to avoid overnight heating. Pre-heating also comes in helpful and comfortable. Purchase a low-voltage technology blanket if you are buying it for kids or want even the pet to snuggle under it. Contact the manufacturer or dealer if you feel there’s something happening with the product that you aren’t sure or aware of. Never use an electric blanket on a person who is disabled, an infant or a toddler as they might not be able to control the temperature settings in case of an emergency. Kids must use the blanket under strict supervision. Keep the power cords free and lose. These must not be stuck anywhere between the mattress or any place where it can get jammed, heat up, damage and cause a fire. Avoid twisting and pinching the power cord or the internal wiring. Avoid spilling water over plugged in a blanket. If you own an electric mattress, do not use it with the electric blanket. There’s a possibility of overheating that can result in fire or disturbed body temperature. You may not want to melt the insulation hence do not iron the blanket. No dry cleaning, please. The solvents can damage insulation. No jumping or sitting on top of the blanket as it can damage the coil. No folding. It can break the wiring mechanism. Don’ use the blanket even if it’s partly wet. The product needs to be completely dry after washing. Do not use the blanket on a sofa, chair, hospital bed or a waterbed. No steaming as it’ll develop moisture inside the blanket and ruin the insulation of wires. Your blanket will develop some creases over the time. Do not try and fix them with an iron. If the fabric is in a poor condition, the temperature keeps fluctuating, the cords are damaged or the blanket is more than 10 years old, it is time for a replacement. Don’t keep using it anyhow! Only a few things differently in the electric blankets from the traditional ones. You just have to make sure that you aren’t damaging the product intentionally and also not using an already broken item. Store the blanket without any folds or creases. Wash keeping in mind the instructions mentioned. And, if you prioritize the aforementioned Dos and Don’ts, your electric blanket will be functional for many more years. It’ll stay well maintained and there’ll be no compromises on the quality.